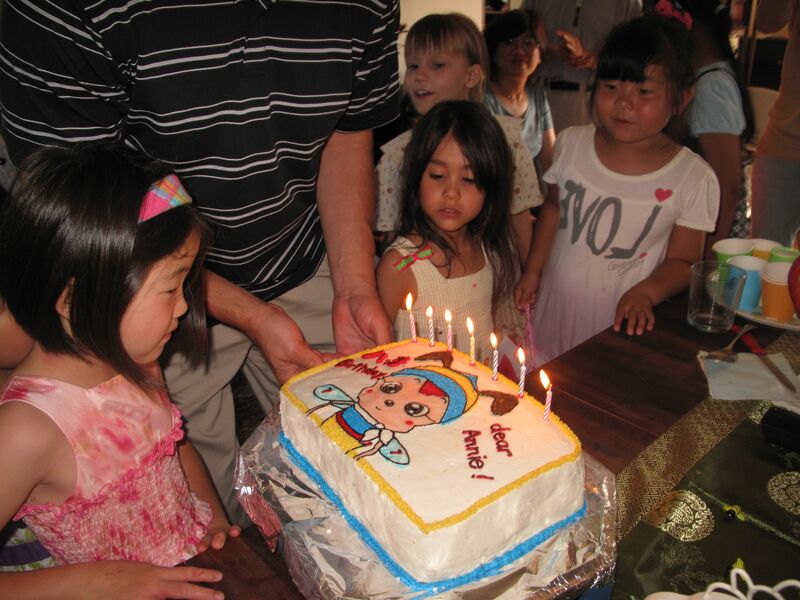 We are still recovering from Annie’s first “girlfriend” birthday party yesterday! Just before she graduated from japanese youchien/kindergarten, her class had done a play taken from last year’s full-feature anime about the life of a bee, called Mitsu Bachi Hachi. Since February, she has wanted a “bee” themed birthday party, so we had a bee tea party (a week before her real birthday because next weekend is busy with other school/travel events). This was the first time she has had a birthday party that was for her friends, and not just a few families we are close to who gather to celebrate her. We invited eight girls, but with moms, some siblings, a dad and an aunt, we had around twenty-five here over the course of the afternoon. One family ended up staying longer and joined us for a simple spaghetti dinner. Here are some photos from the day. The girls made bee mobiles and at the end of the party did a pinata, a first for all the guests. 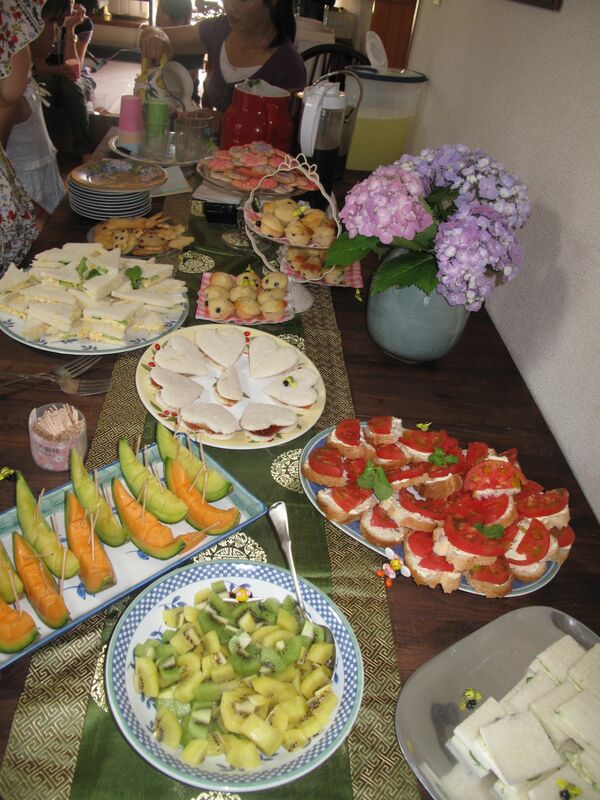 1) It was fun to introduce our Japanese friends to some America “tea” kinds of things – a variety of tea sandwiches: cucumber and mint; tomato and basil and cream cheese; egg salad, and of course peanut butter and jelly; blueberry muffins, fruit, and little cookies. All decorated with little beaded bees (thank you Oriental Trading Company!) It was incredibly hot, so we went with cold teas – mint and peach iced tea and lemonade. 2) Once every two years, I have a chance to pick my favorite flowers from our own garden to decorate our home – hydrangaeas. Because we are in the U.S. every other summer, I miss the June blooming during that time. I love this flower, and the fact that we can celebrate Annie during this time! 3) “Err on the side of graciousness.” When we have a hard time deciding who to invite, we try and go with this simple rule. 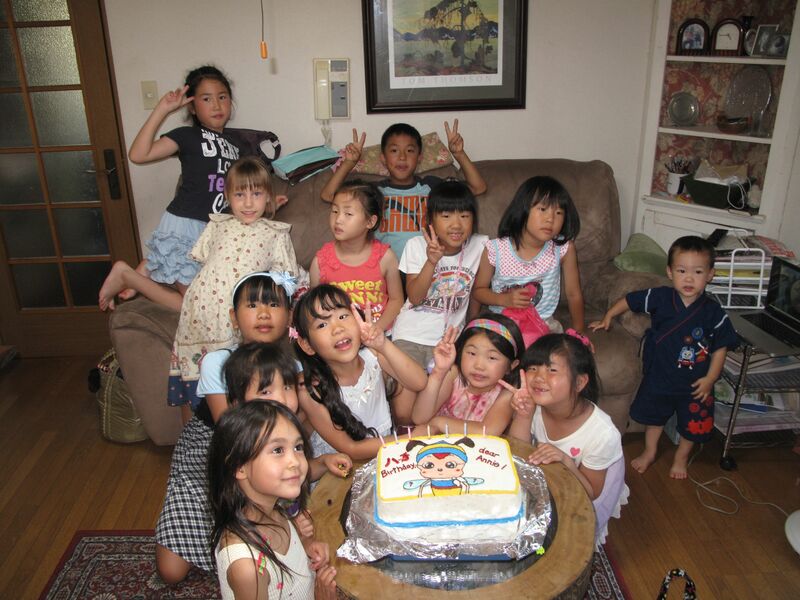 We hesitated to invite so many girls (realizing that 8 girls in Japan could become twenty-five! ), but we are really glad for everyone who came and the chance to have so many in our home. It was great to have two fellow Asian Access moms and daughters join us and help with the entertaining, and our college friend Grace was a huge help as well. 4) We have prayed (as have many of you) for God to help Annie develop special friendships the past few years. She is more reticent in this area, as well as in using Japanese. The past six months or so have been a season of her making significant friends and developing confidence in her Japanese ability. We thank God for this and for our very special and gifted (almost) seven-year old daughter. Happy Birthday to Annie! I’m very impressed with the cake! Did you make it yourself? I LOVE あじさい！Beautiful party! Darling tea party, Sue!! You really have such a wonderful way in the “mother” department. It’s clear to see what a blessing those four lives are to you and Eric! Wish my seven year old tea party lover could have been on the guest list . . . she would have so enjoyed herself!! Yay! What a wonderful party and way to show God’s love! I’m so glad Annie is using her Japanese more comfortably and making friends!!! Otsukaresamadeshita! This looks like such fun! So thankful for the answered prayer that this represents. My only question: did you make the cake and why didn’t we get any late night calls as you were working on it?? Hi Sue! 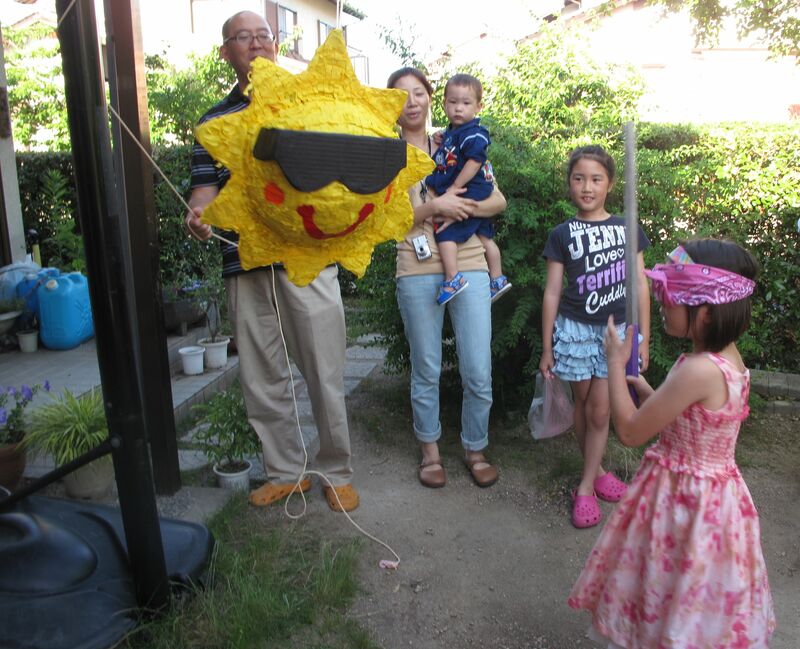 Now that’s a Pinata I can relate to!!! 🙂 Sunshine and sunglasses!!! And Eric right behind, holding it up!!! 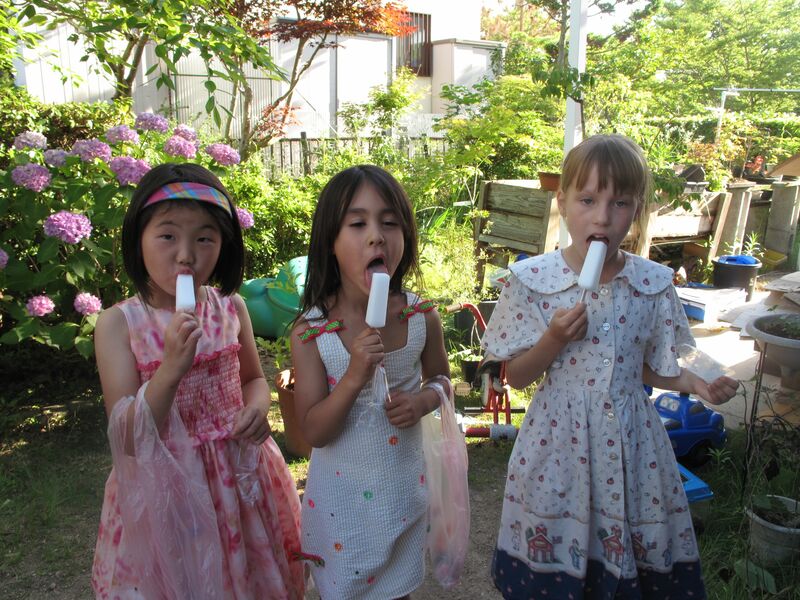 I am sooooo happy to hear how Annie is making friends and more confident using japanese. YES!!! 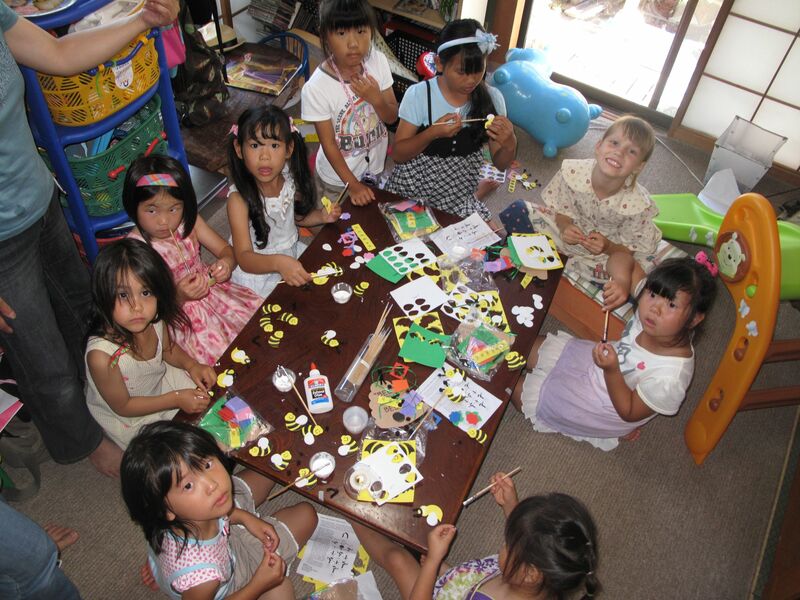 Looks like Annie had a BEE-UTIFUL “Bee Tea” party AND A BIG HAPPY BIRTHDAY TOO!!!! Just love the photos! Sorry I haven’t been keeping up with the posts lately…life sometime gets hectic as you know. But I keep you all in mind and pray for YOU ALL often. Remember to take care of yourselves too. So you can be there for others…. Our Father above keep you WELL! What a lovely party! I think you could be a caterer (in your free time! HAHA!). So glad Annie is coming along in the friend department. Just have to mention that Sarah is having hydrangeas for her wedding! One of my favorites too.